We are down to the final 20 players in Flight 1D of the $230 NLHE Re-Entry event. The final 20 players move on to Day Two. Play will resume tomorrow at noon as the all 80 players will resume play and continue until we have a winner. Stay tuned to FoxwoodsLive.com for all of the updates as well as live streaming video of all the action! With just over 60 players remaining, over half of the original starting field has been eliminated. Play will continue tonight until only 20 players remain. Those 20 will join the other 60 players who moved on to Day Two action. The players in Flight 1D of the $230 NLHE Re-Entry event are now on their first 10-minute break of the day. A total of 125 started and play will continue tonight until only 20 remain to move on to Day 2. The final flight of the $230 NLHE $100,000 Guaranteed event has just begun. Registration is available through the first break, or around 6:15pm. The final 20 players from the 10am flight have just completed play for the day, and they will rejoin the players from yesterday's flights and the 4pm flight tomorrow. The final flight of the $230 NLHE $100,000 Guaranteed event kicks off at 4pm. The final 20 players will advance to Day Two and are guaranteed to be in the money! Players start with 8,000 in chips and the blinds are 30 minutes in length. It looks like there will be an overlay in the $230 Re-Entry NLHE $100,000 Guaranteed event. There is still one move flight this afternoon at 4pm to qualify. The final twenty players in the flight move on to Day Two and are guaranteed to be in the money! Come down to Foxwoods at 4pm for your final shot to get a piece of the $100,000 Guaranteed prizepool!!! The 10am flight of the $230 NLHE Re-Entry event is now under way. Players start with 8,000 in chips and levels are 30 minutes in length. The final 20 players will advance to Day Two on Tuesday. The final flight will be today at 4pm. There is a $100,000 Guarantee on this event! Rami Jradeh Wins the $560 Mega Stack! Rami Jradeh, Miroslav Zamrzla and Ross Santos came to an agreement on a three-way deal. 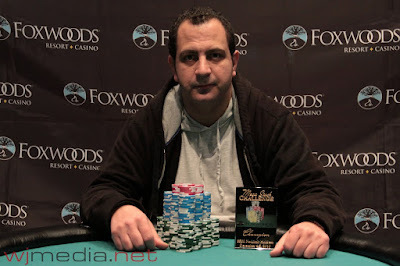 Jradeh was the chip leader at the time of the deal and is officially the winner of the $560 NLHE Mega Stack Challenge event!